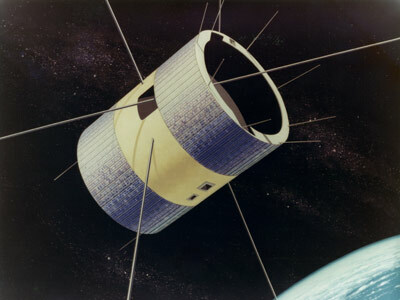 ATS 2 (Applications Technology Satellite) was a medium altitude, gravity-gradient-stabilized spacecraft designed to (1) test new concepts in spacecraft design, propulsion, and stabilization, (2) take high-quality cloudcover pictures, (3) provide in situ measurements of the aerospace environment, and (4) test improved communication systems. The cylindrically-shaped spacecraft measured 142 cm in diameter and 183 cm in length. The spacecraft structure consisted primarily of a corrugated thrust tube with honeycombed bulkheads secured to each end. Equipment components and payload were externally mounted on the outer surface of the thrust tube as well as on a structure that slid into the interior of the thrust tube. Electric power was provided by two solar arrays mounted on either end of the spacecraft's outer shell and by two rechargeable nickel-cadmium batteries. Extending radially outward from the side of the spacecraft were four 28.2 m, adjustable gravity-gradient booms. The spacecraft telemetry system consisted of four 2.1 W transmitters (two at 136.47 MHz and two at 137.35 MHz), in addition to a microwave communications experiment. The second stage of the ATS 2 launch vehicle failed to reignite, resulting in an unplanned elliptical orbit. Stresses induced by this orbit eventually induced spacecraft tumbling. In spite of these conditions, useful data were obtained from some of the experiments, most notably the cosmic-ray and particle experiments and the field detection experiments. The satellite reentered the atmosphere on September 2, 1969. ATS-4 (Advanced Test Satellite) launched from Cape Canaveral, August 10, 1968, to test gravity gradient stabilization at synchronous altitude, failed to reach the desired altitude, and though partially operational, could not fulfill mission objectives. The spacecraft reentered the earth's atmosphere over the Caribbean October 17, 1968. Two cesium-contact ion engines were launched aboard the ATS-4 spacecraft on August 10, 1968. Flight test objectives were to measure thrust and to examine electromagnetic compatibility with other spacecraft subsystems. The 5-cm-diameter thrusters were designed to operate at 0.02 kW and provide about 89 mN thrust at about 6700 s specific impulse. Thrusters had the capability to operate at 5 setpoints from 18 mN to 89 mN. Thrusters were configured so they could be used for East-West stationkeeping. Prior to launch, a 5-cm cesium thruster was life tested for 2245 hours at the 67 mN thrust level. During the launch process the Centaur stage did not achieve a second burn, and the spacecraft remained attached to the Centaur in a 218 km by 760 km orbit. It was estimated that the pressure at these altitudes was between 1.3 × 10-4 Pa and 1.3 × 10-7 Pa.35 Each of the two engines was tested on at least two occasions over the throttling range. Combined test time of the two engines was about 10 hours over a 55 day period. The spacecraft re-entered the atmosphere on October 17, 1968. The ATS-4 flight was the first successful orbital test of an ion engine. There was no evidence of IPS electromagnetic interference related to spacecraft subsystems. Measured values of neutralizer emission current were much less than the ion beam current implying inadequate neutralization. The spacecraft potential was about -132 V which was much different than the anticipated value of about -40 V.
ATS-5, the last spacecraft in the Hughes/NASA ATS program, was launched August 12, 1969, in a near-perfect trajectory for insertion into synchronous orbit. Although injected successfully into orbit, the spacecraft's reverse spin (counterclockwise) prevented successful deployment of the 124 foot gravity gradient booms for the stabilization experiment. However nine of the other 13 experiments aboard the spacecraft returned useful data. ATS-5 was retired in March 1984. A flight IPS, identical to the one flown on ATS-4, was launched on ATS-5 on August 12, 1969. The purpose of this flight was to demonstrate NSSK of a geosynchronous satellite. Once in geosynchronous orbit the spacecraft could not be despun as planned, and thus the spacecraft gravity gradient stabilization could not be implemented. The spacecraft spin rate was about 76 revolutions per minute, and this caused an effective 4g acceleration on the cesium feed system. The high g-loading on the cesium feed system caused flooding of the discharge chamber, and normal operation of the thruster with ion beam extraction could not be performed. The IPS was able to be operated as a neutral plasma source, without high-voltage ion extraction, along with the wire neutralizer to examine spacecraft charging effects. The neutralizer was also operated by itself to provide electron injection for the spacecraft charging experiments.